There are geeky properties that I never gotten attached to despite how popular they were. For me, that property was the phenomenon that is known as Saban’s Mighty Morphin Power Rangers. I tried to watch the first couple of episodes of the first season that was to be one of the longest running children’s programs ever. But, unfortunately, I never really got into it. I liked it when they got to the fighting and the theme song is something that’ll get stuck in your head once you hear it. But the parts of the show where they were out of the costume and it was more like a Saved By The Bell ripoff, a show I didn’t care for all that much either, got on my nerves incredibly fast. I gave up on the show after the first couple of episodes. Now, this review is a SPOILER FREE review and, honestly, there’s nothing all that much to spoil anyway. Still, if you’re worried that I’ll give any major story details, don’t fret! Anyway, the new Power Rangers has generally the basic story structure of the original series. Five teenagers are appointed by Zordon to become the Earth’s defenders against Rita Repulsa. They do try to update the story to fit what modern audiences expect and that works to a certain degree. The new Power Rangers is definitely more serious in tone and darker at times. Gone are the campy story bits with the “teens with attitude” and are replaced with angst and insecurity. There’s no Bulk and Skull, the two bullies from the original series who served as comedy relief. There’s virtually no slapstick comedy scenes here. But they still try to keep some of the cheesiness that made the show such a hit. This exemplifies the new Power Rangers movie’s greatest flaw: it’s all over the place. There are a lot of scenes where the action is on point, like when the teens are exploring their new powers and abilities by climbing mountains and jumping off cliffs that are really thrilling. However, the film then switches to slow motion shots of them just swimming in a cave shortly after, which was just jarring. It’s like just when things were getting good, they slam on the brakes. Also, there are times when I felt the film needed a shot of adrenaline but instead, the film decides to slow things down and use slow motion to capture the scene. Some of the action scenes, especially near the end of the film, should have be shown at a breakneck speed instead of “dramatic” slow motion. It certainly doesn’t help that Power Rangers bounces from one film genre to another. It’s like they got the scripts from a young adult screenplay, a horror film, a campy sci-fi epic, a superhero film and giant mecha film and rolled them into one movie. It just makes it feel like the film is suffering from some form of schizophrenia and can’t decide what it wants to be. It runs the gamut of all of these tonally different styles of film and they just don’t mesh well in a cohesive way. The film is also oddly paced and actually kind of slow. It tries to build and build up to the climatic scene where the Power Rangers in their Zords take on Rita Repulsa and the giant Goldar. But because of the sloppy way everything is mushed together, it’s really hard to get truly invested in the climactic battle. I will say that the acting overall was surprisingly good. And I don’t even mean the big named stars like Bryan Cranston and Elizabeth Banks. No, the actual five Power Rangers were much more than respectable. They can pull off some drama. Not all that well, mind you. It’s not like I’m going to follow their careers because I’m expecting them to deliver an Oscar worthy performance in their next film. But all of them do come off as extremely likable for the most part. Their collective performances were good enough if you really suspend your disbelief, which you gotta do with a movie that’s generally as silly as Power Rangers. The performances of the big named stars definitely outshine the teens. Bryan Cranston, even though he’s just a giant face on a wall, still pulls off a really good performance just because of the way he delivers his lines. He actually makes a great Zordon as he does come off as wise… most of the time. I was actually surprised with Bill Hader’s performance as Alpha 5. I don’t think anyone who’s a fan of the show ever liked Alpha 5 because he was such a dumb character. He still kind of is in the 2017 film but he’s shockingly not annoying in the least! He even gives off that “ay-yi-yi” squeal like in the original show but it just comes off naturally. I’m as amazed as you are. But the real star is Elizabeth Banks as Rita Repulsa. I know this version of Power Rangers is supposed to be gritty and realistic, with angsty teens, no comedy relief characters, yadda yadda yadda. Still, Elizabeth Banks just pours on the camp in her role as the supposedly frighteningly and super powerful Rita Repulsa and, while it shouldn’t work because it’s just so different from the overall tone of the film, it was just a joy to see her on screen all the time. There’s just a lot of gusto in her over-the-top performance. It’s a delicious portrayal and probably one of the things I enjoyed the most about the film. The special effects are a huge mixed bag with lots of good stuff and lots of missed opportunities. They suits and the costumes look really fantastic. This isn’t your silly spandex outfits you can get at a costume store. There’s a lot of detail in the Power Rangers armors and I appreciate how much work they put into them. Rita Repulsa’s new look is also really good as it’s still menacing looking even while Elizabeth Banks is delivering her lines in the shrill voice like the character did the original show. However, the folks as Saban went overboard with the design of the Zords and the huge monster at the end. They suffer from Transformer-itis, where it becomes hard to distinguish which Zord is which in the heat of battle. Also, Goldar seems to be missing a face, which is a shame because that was one of his more distinguishing parts of the character! The special effects were actually pretty good as the CGI does mesh well with the live action. That is, if you’re not looking all that hard. The giant floating Zordon/Bryan Cranston head is impressive looking and even the CGI Alpha 5 interacts well with the live action. But the fight scenes with the Putties (Rita Repulsa’s foot soldiers) look rather fake and not believable. Even the climactic final battle looked unrealistic because of the way the final Megazord and Goldar are designed. 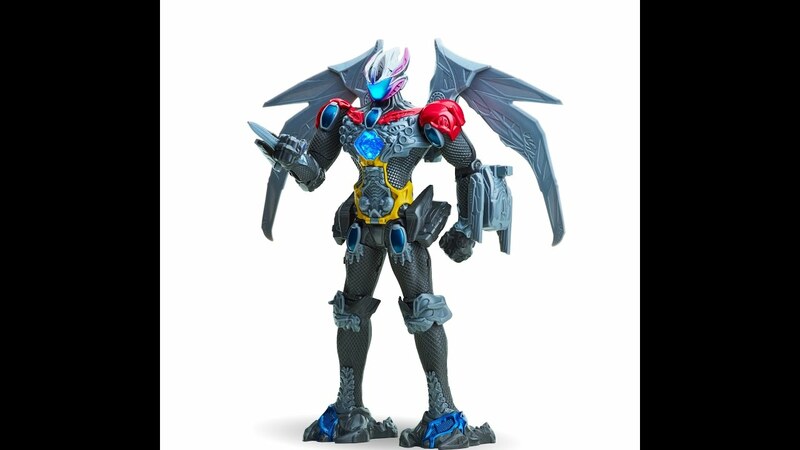 Thankfully, the Megazord at least looks much better than the atrocious toy. Ugh! Overall, I did enjoy Saban’s 2017 reboot of the Power Rangers but not to the extent that I wanted to. My expectations for the film were already pretty low and, while it did exceed my expectations, it didn’t exceed them by a whole lot. It’s an uneven film that tries to juggle a lot of genres and fails. I’m not totally sure if a true blue Power Rangers fan would like the film more than me or would actually be appalled by what they did with their favorite franchise. Essentially, I expected a “meh” film, and I got a “meh-plus” film. Have you seen the 2017 Power Rangers movie? What did you think of it? Let me know in the comments section below!